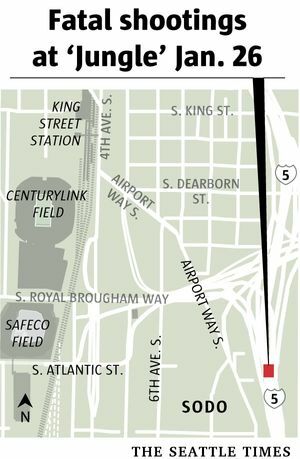 The state Legislature may approve $1 million for a razor- and barbed-wire-topped fence to enclose the notorious homeless encampment in Seattle where two people died in a shooting last month. The latest idea for what to do with The Jungle, the notorious homeless encampment under Interstate 5, might remind you of a prison. Budgeted at $1 million, a proposed 8,000-foot-long fence under consideration in the state Legislature would consist of chain link topped with three strings of barbed wire circled with razor wire. At 6 feet high, it would encircle 100 acres in a 3-mile area by the freeway. That’s the kind of fencing you find at corrections centers. That might describe trying to climb over it, but also how some taxpayers might describe the cost, especially when additional expense is factored in. Like security for the fence. One measure of how much security would cost comes from Securitas USA, the firm that provides security for such clients as Sound Transit, Weyerhaeuser and Microsoft. Presumably, private security would be cheaper than actual Seattle police officers. “Three guards around the clock would run $600,000 a year,” says Carlos Gil, business development manager for Securitas’ Seattle division. It’s not clear where that money would come from. The $1 million has been requested in the 2015-17 supplemental transportation budget in the state Senate, says Sen. Reuven Carlyle, a Seattle Democrat. Other members of the city’s delegation joined him in requesting the money. “We all know it’s a deadly area, and it’s time to clean it up and secure it,” says Carlyle. The Jungle was the site of a shooting Jan. 26 in which two people were killed and three wounded. Three teen brothers have been arrested in the case. The state’s Department of Transportation says it hopes that bids to build the fence will come in at less than $1 million, so that $100,000 is left for cleaning out the entire greenbelt. In trying to save money, Erickson says WSDOT eliminated having the fence buried 2 feet down to prevent digging, and it opted for lighter wire. The fence would be installed with gates on both sides of the state’s right of way, from South Dearborn Street to South Bayview Street. But maintenance and security costs? He also says the fence needs to be built with “a transitional plan” so that the homeless can go to sanctioned housing. One person expressing doubts about the fence is Alison Eisinger, head of the Seattle/King County Coalition on Homelessness.